War of 1812 Autograph Document Signed “Wm. N. Jarrett” 1pp. 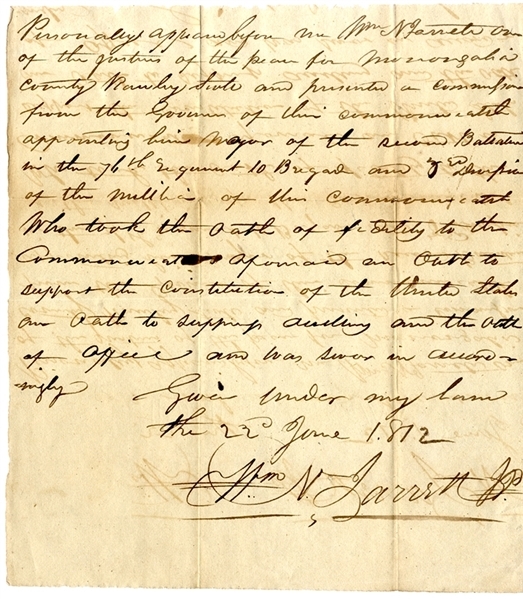 quarto, June 23, 1812, and reads in part: “...Personally appeared before me ...Rawley Scott and presented a commision from the Governor of this commonwealth appointing him major of the second Battalion in the 76th Regiment 10 Brigade and 3rd Division of the Militia...Who took the oath of duty to the commonwealth...” Fine condition.